Free Float® steam traps that offer continuous discharge and are optimal for processes. Low pressure use, up to 2.1 MPaG. Free Float® steam traps that offer continuous discharge and are optimal for processes. Mid to high pressure use, up to 12 MPaG. Some models for use in main lines also available. 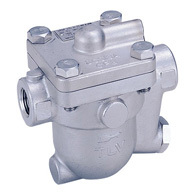 Free Float® steam traps with a built-in bypass valve.